In his 2012 State of the Union address, President Obama claimed that "over a thousand Americans are working today because we stopped a surge in Chinese tires." The tire tariff case, decided by the president in September 2009, exemplifies his efforts to get China to "play by the rules" and serves as a plank in his larger platform of insourcing jobs to America. However, our analysis shows that, even on very generous assumptions about the effectiveness of the tariffs, the initiative saved a maximum of 1,200 jobs. Our analysis also shows that American buyers of car and truck tires pay a hefty price for this exercise of trade protection. 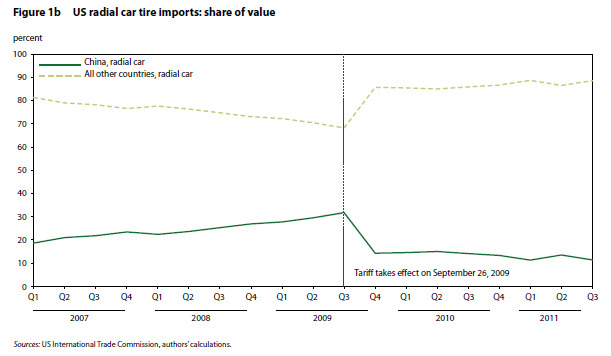 According to our calculations, explained in this policy brief, the total cost to American consumers from higher prices resulting from safeguard tariffs on Chinese tires was around $1.1 billion in 2011. The cost per job saved (a maximum of 1,200 jobs by our calculations) was at least $900,000 in that year. Only a very small fraction of this bloated figure reached the pockets of tire workers. Instead, most of the money landed in the coffers of tire companies, mainly abroad but also at home. The authors point out "While this figure ($900,000 per job saved) seems extravagant, it is consistent with prior research. Studies repeatedly show that the consumer cost of trade protection typically exceeds, by a wide margin, any reasonable estimate of what a normal jobs program might cost." In other words, it would cost the economy much less overall to not impose the tire tariffs and instead direct compensation towards workers in the tire industry in some other way. In fact, it would have been cheaper to just idle the 1,200 tire workers and pay them their full salary, of let's say $75,000 per year, than to impose tariffs that cost the economy almost $1 million per worker. This is a good example of why economists don't as a group support trade protection and instead favor free trade: the total costs of protectionism always outweigh the total benefits to the protected industry, resulting in a net loss and making the overall economy worse off, not better off. Indeed. Of course, as with any protectionism, the problem is that the USW (via jobs, dues and bragging rights) and President Obama (via union votes and campaign donations) benefited directly from these tire tariffs and got to mask those benefits behind some sweet, sweet China-bashing, so it's unlikely that common sense and the opinions of vast majority of economists - both conservative and liberal - are going to change their minds about the tariffs' "benefits" anytime soon... no matter how much they cost. 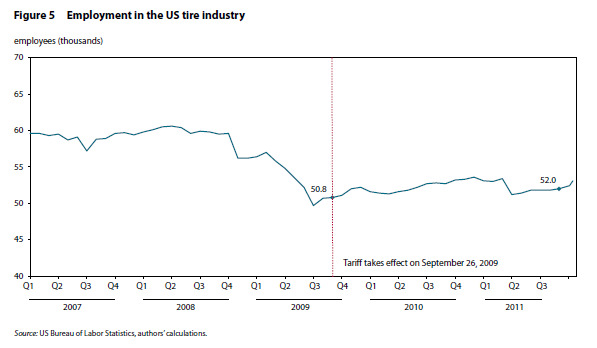 Clearly, the tariffs weren't some magical launchpad for US tiremaking jobs. Thus, it's extremely likely that President Obama's claim that his tariffs saved (or created) 1,200 American jobs is nonsense, and that the actual number of such jobs far lower. (And, obviously, it's extremely disingenuous for the President and his team to be taking credit for all those jobs.) If this conclusion is correct (and, let's face it - it is obviously correct), then the tire tariffs imposed in 2009 cost the American economy (disproportionately lower-income US tire consumers) way, way more than $900,000 per job. In President Obama's 2012 State of the Union address, he said that the Section 421 tariffs on Chinese tires would serve as the model for his new China Trade Enforcement Team. At the time, I opined that "Obama's vaunted tire tariffs - literally the centerpiece of his 'new' unfair trade enforcement initiative - have nothing to do with unfair trade and have proven to be an abject failure." Now we know that that failure was really, really expensive. So if we can expect President Obama's China Team - and his second term more broadly - to result in more such "successes," we better start saving our pennies right now. How many more highway fatalities from driving on worn out tires due to higher replacement cost? Good question, Greg. But why let a little thing like death ruin a sweet political payoff?